The second cohort of our CLAHRC fellows came together with members of the CLAHRC to talk about their experience as CLAHRC fellows and to present their fellowship projects. The programme for the afternoon did not disappoint the audience who came along to listen, from the CLAHRC and from our external partners. Professor Carol Brayne opened the session which was held in the Herchel Smith building. Dr Dickon Bevington, Consultant in Child and Adolescent Psychiatry, presented his project “AMBIT and TiddlyManuals – who works for what and what works for whom? Developing knowledge about workers, outcomes and implementation of a novel manualised method of practice.” This project won the Guardian Business Media ‘innovation nation’ award for collaboration. Erica Chisanga, Consultant Nurse – Epilepsies, at Addenbrooke’s Hospital reported on her project “Psychogenic Non Epileptic Seizures (PNES)-Mapping out the follow-up care of patients with a confirmed diagnosis of PNES following video EEG telemetry”. Erica told us about the challenges that she had faced in obtaining ethics approval for her study and balancing a full time job, but found the fellowship very rewarding. Mark Hall, Service development manager at CPFT presented the findings of his project “Home coming – How best can the needs of men and women with Intellectual Disabilities from out of area placements be met locally, and what are the barriers?“ Mark spoke about the background to his study and how best the needs of men and women with intellectual disabilities from out of area placements can be met locally. The moving NHS landscape also presented some difficulties. Mark said that the project supervision and fellows teaching had been very helpful. Dr Rebecca Jacob, Consultant Psychiatrist presented “Identifying Medically Unexplained Symptoms among Frequent Attenders to the Emergency Department: Research to inform Service Design“ which built upon a project by a CLAHRC fellow from our first cohort, Dr Ann Mai Wong. Rebecca’s project was done in the emergency department of Addenbrooke’s Hospital and involved a case note review of patients attending ED more than 4 times in 12 months. Results will be used to inform service redesign for ‘frequent attenders’. 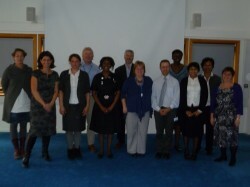 Dr Anna Maw, Consultant Paediatric Neurologist – presented “Acquired Brain Injury in Childhood – Back to the Beginning“. Anna spoke about the many consequences of acquired brain injury (ABI) in children which can remain hidden or unrecognised for years. Anna hopes that her work will contribute to an understanding of the best configuration of services for those children with ABI. “Falling off the cliff: what’s happening to young people in mental health services?” and ” Influencing change in the NHS: how to make it happen“ were the titles of joint projects by Dr Sarah Maxwell, Consultant Child and Adolescent Psychiatrist, and Dr Uju Ugochukwu, Consultant Psychiatrist who both work at the Norfolk and Suffolk Foundation Trust. Sarah and Uju were looking at the development of a youth mental health service in Great Yarmouth and Waveney and mapped the characteristics of the 14-25 year olds who use the service. An interesting finding was the apparent deficit in the referral of teenage boys, and the reduced contact of 18-20 year olds. It appears that many young people are either being re-referred or moved from service to service. Recommendations from their research have been adopted by the Trust. Dr Richard Moore, Clinical Psychologist, presented “A long-term retrospective evaluation of service use by patients with chronic depression.“ which was part of a randomised controlled trial (RCT) of the clinical and cost effectiveness of a specialist mood disorders team for refractory unipolar depressive disorder. Richard found that there was a great degree of variability in cost due to the high cost of hospitalisation. The study confirms that high quality maintenance treatment for chronic depression is value for money if it keeps people out of hospital. Anne Necus, Consultant Clinical Psychologist, presented her findings of her project titled “Evaluation of Fenland Behaviour Consultation Clinics: arriving at a methodology“. Anne observed that it is essential to build in carer and worker involvement into a study of service performance and that commissioners and service managers are key to continuing applied health research. Dr Pranathi Ramachandra, Consultant Old Age Psychiatrist, presented her project titled “Joined up care and research in dementia: Braiding the strands“. This involved an audit of the records of patients who came through the Older Peoples Mental Health Service (OPMHS). A mismatch between the number of patients who were ‘officially’ on the dementia pathway and those who were actually on the pathway was uncovered. Pranathi has implemented systems where ICD-10 coding of all new referrals to OPMHS is done so that records can be retrieved electronically. This data will contribute to the local dementia register which is in the planning phase. Dr Judy Rubinsztein, Consultant in Old Age Psychiatry, presented her project “Balancing the costs and quality of different memory service models“ in which she aimed to evaluate the average unit cost to secondary care for patients presenting with memory problems in a Memory Clinic vs a traditional service. Judy is planning to publish her findings. Dr Jenny Spencer, SpT in Psychiatry, studied the “Prospective risk assessment in mental health services“. Jenny explained that she had only just received ethical approval for her study and was planning to spend her research day in her final year of psychiatry training in finishing the project. Common experiences of the fellows was the difficulty in obtaining data and data integrity, juggling their usual job with the fellowship, and in some cases the length of time obtaining ethical approval where it was needed. Overall the fellows expressed their enjoyment of the fellowship year which had valuable gains for their personal development. Professor Peter Jones, Director of the CLAHRC CP, closed the session and congratulated the fellows on the work that they had done, especially to those who had already influenced service redesign . Professor Jones hoped that the fellows would be able to develop their work to the point where it could be published. He also thanked all those who contributed to the success of the CLAHRC fellowship, particularly the project supervisors, the teachers on the fellows workshop programme, Professor Mike Cook who runs the Action Learning Set and Dr Christine Hill who is the lead for the fellows programme. We hope that the fellows enjoyed their time with the CLAHRC and that they will take their skills back to their workplace with a new understanding of research, innovation and service redesign that will ultimately help our patients, carers, service users and their families.